At the end of every event must be celebration and reflection. Back in September I floated an idea to our divisional leadership team. As we sat and discussed our long range professional development plan for the year, I threw out the idea of introducing EdCamp as part of our PD structure. The team of 7 other leadership professionals had never heard of the model and were intrigued. But, just like things do in a school setting … conversation moved along and we were on to another topic. A few days later, one of my coworkers and fellow leadership team members (our PYP coordinator) approached me with, “So, about this EdCamp … tell me more.” My smile must have been huge as I explained, mumbled, and rushed my way through the EdCamp model and all it’s benefits as part of a balanced professional development plan. What felt like eons later (which was only a matter of minutes) she looked at me and said, “I’m in. How do we do this?” So began the amazing experience that we have had over the last 7 months of planning, launching, and adapting the EdCamp Model for an International Elementary School setting. Step 1: Recognize and celebrate the fact that in our elementary campus alone, we have over 125 staff who are professionals filled with knowledge, resources, and passion that needs to be shared. Instead of focusing on a few individuals within the school who might have “tenure” or “titles” as people who should “develop” us, we looked at all the voices that had yet to be heard. We acknowledged the fact that each educator within our school carries a backpack of knowledge that they have never really had the opportunity to unpack. We also recognized that empowering our staff to develop one another, rather than the same few talking at the front of the room, would create buy-in and trust in our professional learning environment. Step 3: Put our ears to the ground and listen. We listened to staff in their everyday conversations and along the way, collected valuable information. As we overheard these conversations, we took notes and noted them as potential learning/sharing opportunities from a variety of staff. Within a matter of days we had collected over 20 different ideas that would make for amazing EdCamp topics and we had barely scratched the surface. 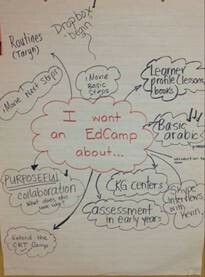 Step 4: Recruit our teachers to participate in the EdCamp model of PD whether they bought into the model or not. We invited staff from our created list above to a meeting to share with them “an exciting new proposal of professional development.” At the meeting we shared our vision, a few videos on what EdCamp looks like, and the idea of teachers dialoguing with teachers to inquire into topics that are valid, timely, and meaningful to them. As the staff kind of looked around like “so what” we then broke out of list of conversations we had heard around the halls. We then asked them to be risk-takers and step up at our first EdCamp to sign up to facilitate a discussion. We provided them an “out” and explained that this had nothing to do with power points or being an expert who is disseminating information. Rather, come with a question, an inquiry, and a desire to share with other professionals. Low stakes and high returns — that is the entire premise of EdCamp. Our first EdCamp sign up wall. Step 5: Launch the model school-wide and get entire staff excited to learn/develop in a new, meaningful way. For a week, we had a colorful board with blank construction paper in our common room. Staff were encouraged to sign up to host a camp around a specific topic. As staff stepped out of their comfort zones and created EdCamp topics, more and more staff stopped to ask questions and inquire into the model. It was a natural provocation — EdCamp Style. At the end of the first week of sign up, we had 12 different sessions that staff had volunteered to host. As we stood at our staff meeting, explained the model, reminded everyone the onice on learning and developing fell on their shoulders, you could feel the energy in the room. Some were excited. Some were skeptics. No matter what, though, everyone was required to participate. As we regathered as a collective staff at the end of our first hour session of Edcamp, people were talking. We did a reflection share out (share with someone not in your camp a new learning/take-away/question) and then scaled the success of the first event. The feedback was positive. People felt empowered, engaged, and excited to be part of a professional development plan that valued the voices of those around them. My educator goosebumps ensued. Step 6: Create a system for staff to suggest new EdCamp topics or request specific camps to be covered. We allowed staff to have voice and make requests of how to direct their learning. After each EdCamp PD session, we would tear down the previous EdCamp board and create a blank slate for new staff to sign up to facilitate a camp. There was lots of encouragement and many reminders that anyone was qualified to post a topic (and times we thought the board would never fill up). 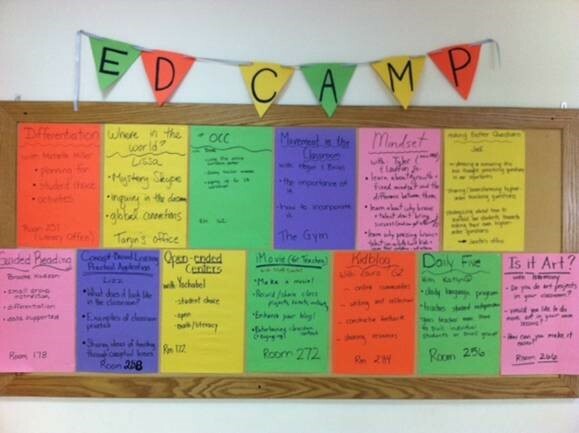 However, by the start of every staff meeting where EdCamp was the model of PD, we had our required number of sessions and a large variety of learning that would be happening from-peers-for-peers in our elementary halls. A space for staff to make recommendations for future EdCamp topics. Step 7: Require “action” and ask staff — “What are you doing to continue your learning now that your hour session is done.” Some of this self-directed action took the form of: Visiting other classes to see how centers are utilized/setup. Sharing journal articles and research found after the camp was over. Setting up Twitter accounts to connect with the global PLC. Inviting a teacher in to facilitate a mystery Skype with her classroom so the other teacher could observe/learn. Creating a Google Doc of music for Brain Breaks and Mindfulness. And much, much more. As connections were created inside the EdCamp, they continued to develop outside of the professional development “required hours.” We saw a shift in staff feeling more comfortable collaborating with fellow staff and not looking at each other as judging competition. What a victory that is. 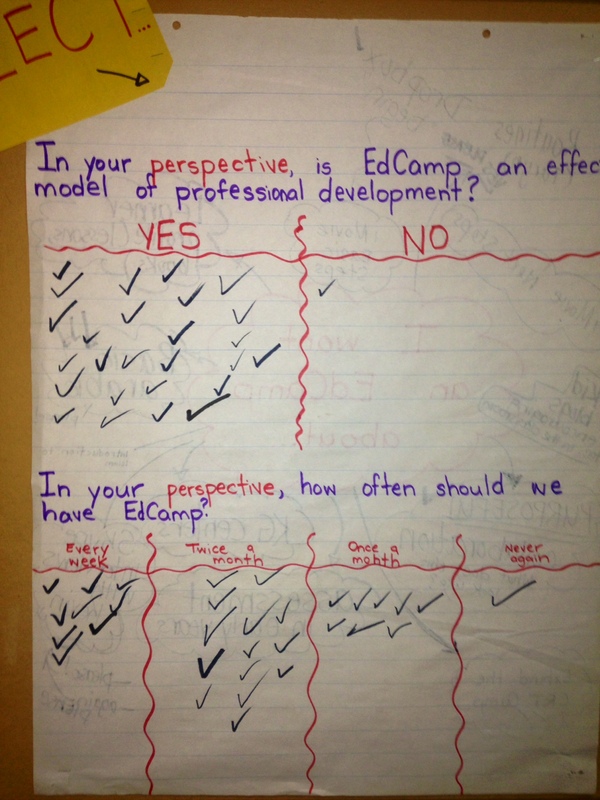 An EdCamp Formative — Do staff appreciate this model of PD? Step 8: Keep reflecting on the effectiveness and impact this model has on professional development. As a team (of 2) planning EdCamp and advocating to keep it in the PD rotation, we regularly reflected, collected feedback, and adjusted the model as our staff saw appropriate. We never settled or stopped asking “How can we improve? Is this model of PD developing staff for the betterment of students? Should we continue EdCamp?” Rather we let this be an ever-changing, organic, working-process that grew out of the interests and expertise of the school community and continued to direct back to the staff that the success of this model relied on them. And so, as the school year is winding down and staff meetings have become filled with all the year end requirements of an international school, we are saying goodbye to EdCamp until August. It has been an exciting, eye-opening, and at times frustrating experience. However, the final feedback and reflection has been positive and promising that the model can continue on in the upcoming academic year. Staff feels empowered and they trust that their admin team views them as knowledgeable, valuable employees with skills and knowledge that can be imparted beyond their classroom walls. If nothing else, I call this self-efficacy success — EdCamp Style. Let the celebrations ensue!